Here in London I’ve come to the end of my second term of postgraduate study at Central School of Speech & Drama. It’s been a challenging term full of collaboration, experimentation, agitation, and documentation. And in a little under a week’s time I’ll be flying out of Heathrow to be reunited with my beloved New York City and Texas. But before I get into my return to the USA, let me tell you what I’ve been up to. As part of my course, I became a founding member of an 11 person performance group. We called ourselves Monkey Tomorrow. For nine weeks we worked together, experimenting with company structure and theatrical conventions. Our aim was to tell old stories in new ways. 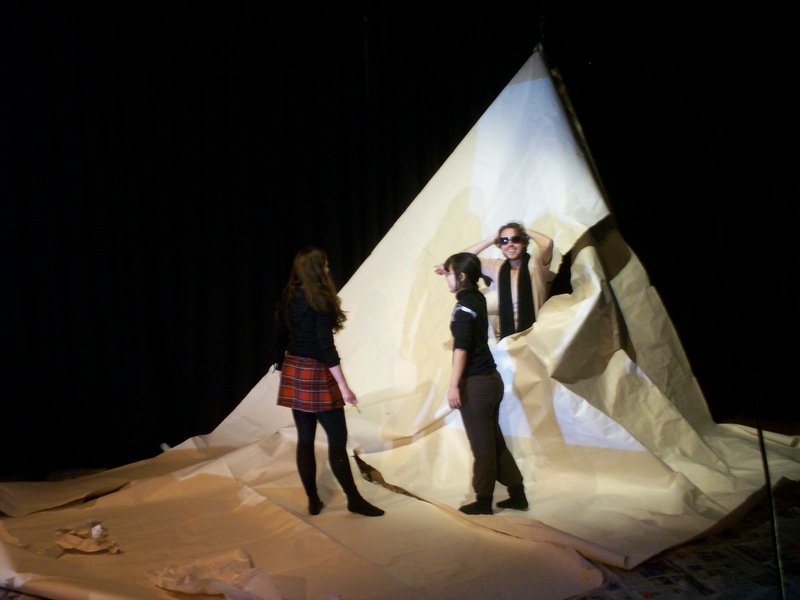 This involved the use of lots of projection and giant sheets of paper. (See above for photographic evidence of the epic nature of our paper.) My role in the group was member of the playwriting team (there were three of us) and editor of the script. And let me tell you something. I learned a lot. I learned that collaboratively writing dialogue for a play can be excruciating! (Seriously, just run a google search looking for tips for collaboratively writing a play. There are none!) I also learned that although we may not always be aware of them, most artists have set working methods. And folding other people into those working methods can be a real challenge. The members of Monkey Tomorrow represent no fewer than 8 separate nations. We speak no fewer than 7 different languages. And of course our artistic backgrounds are as diverse as we are. In our company we had to learn how to build bridges to span innumerable communication gaps. We were not always successful. But I will say this: through our company we were able to create new worlds through explorations of text, movement, and technology. I think it’s accurate to say that none of will ever forget the time when we were known as Monkey Tomorrow, when we struggled to understand one another and the art that we long to create. We’re all hardworking, talented artists. Every member has my utmost respect. And as we move on to other projects, I am grateful to each and every cheeky monkey. Well, as I mentioned before, I’ll be coming back to the United States. (For a visit! I’m not done with this program just yet.) I’ll be spending a few days in Texas visiting family and just over two weeks in New York City relaxing and renewing contacts. I’m looking forward to seeing some of my old and new collaborators back in the States! And let’s be real. I’m also looking forward to pizza, enchiladas, and Blue Bell Ice Cream. There’s a lot on the horizon. Stay tuned for news about the Postgraduate Research Conference at Central School of Speech & Drama, the continued development of my writing workshop series, and work that will take me South of the Border. It’s an exciting world, y’all! I’m ready to see more of it.